1. Pick up the gift card which has the dollar amount you would like to purchase. 2. Take to the check out. Once paid for, it will be activated and loaded with the value printed on the front of the card. 3. When you get home scratch the gray security bar on the back of the card to reveal the 15-digit code. 4. Go to http://www.steampowered.com/wallet and sign in if you aren't already. 5. 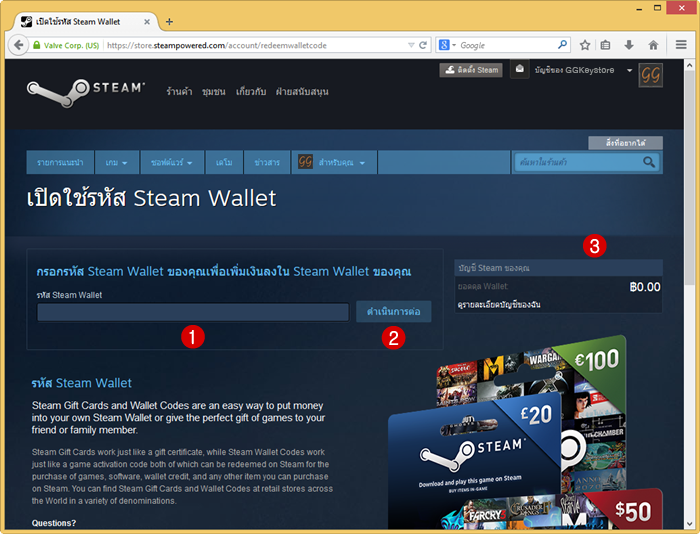 In the resulting screen enter your code into the “Steam Wallet Code” field. 7. Now you will have the amount of denomination of the gift card added to your Steam Wallet which is viewable in the upper right corner of Steam.